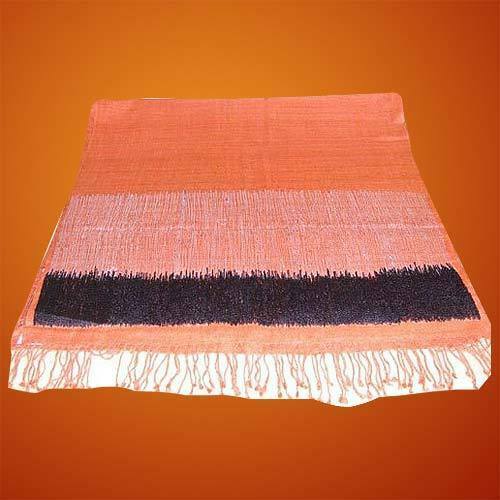 We are involved in manufacturing and exporting superior quality of Bangalore Plain Dupion Silk. These are manufactured using quality basic material and are offered in variety of colours and designs in plain pattern. Brings a classic look to any interior, these are available at industry leading prices to our wide spread clients. With humble beginnings just 3 years ago, Tanushree has created a niche for itself in the international silk fashion and furnishing industry. Keeping with the dynamic and ever changing Global fashion trend, every season Tanushree brings out its splendid collection of designer fabrics and stoles. Committed to meet the international standards and specifications applicable to the silk industry, all fabrics at Tanushree are dyed using azo-free dyes & chemicals. Adhering to committed timelines and production of superior quality fabric has helped us gain the trust and confidence of top fashion houses across the world. Our silk & silk mix fabrics are offered across Japan, Canada, Spain, Switzerland and the USA.